Perched on a mountain-top in Sidwashini, a 10 minute drive from the Swazi capital Mbabane, is a gathering of colourful houses and buildings. That’s Waterford Kamhlaba UWCSA. Originally designed by renowned architect and WK Parent, Amancio (Pancho) Guedes, Waterford has grown as much in physical size as it has in student numbers. The campus has exceptional sports, arts and learning facilities. From the newly renovated Multi-Purpose Hall and rock-climbing wall, to the Richard and Sheila Attenborough Fine Arts Center and the Creative Center for Dramatic Learning (CCLD) with its Amphitheatre, to the Energy Hub and permaculture gardens, there is a space to help facilitate the growth of all our students. Waterford is also home to an incredible blend of indigenous flora and fauna. 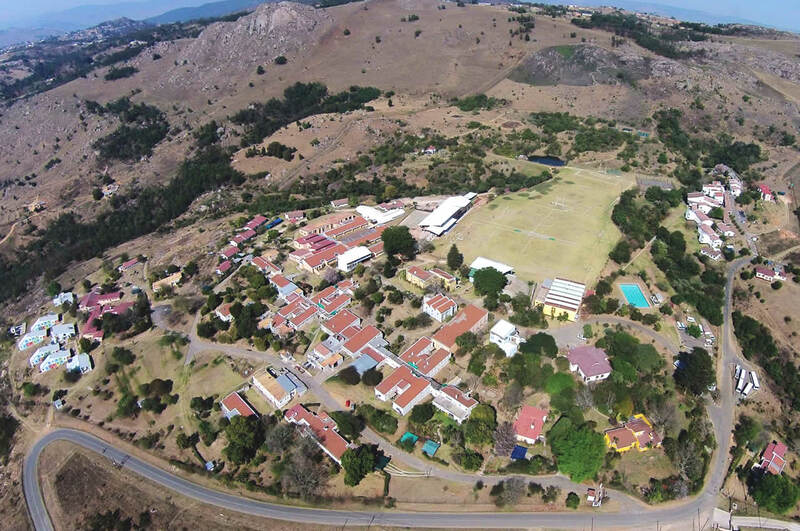 Hiking trails up the school’s peak provide an incredible view of eSwatini’s picturesque landscape. And if all of that isn’t enough, Waterford has a bus service that allows students to shop and socialise in the capital city, Mbabane, twice a week. The Waterford community is highly influenced by the social, historical and cultural context of eSwatini. The ‘one world’ (‘Kamhlaba’) that exists at the top of this Swazi mountain is that of international integration within a Swazi setting. Students are encouraged to explore and enjoy the country and its culture and, as a result, many Waterford alumni (both Swazi and otherwise) return here after university to work or settle. For a list of exciting adventures and places to eat in eSwatini, click here. Travelling from Johannesburg/Pretoria, South Africa, head toward Oshoek/Ngwenya border post. The journey should take you approximately four hours. From Oshoek/Ngwenya, head southeast down the highway (MR3) towards Mbabane for about 20 kilometres. At Junction 9 take the off-ramp and turn right under the bridge – Waterford Kamhlaba is then sign-posted. From Maputo, Mozambique there are two entry points to use, Lomahasha and Mhlumeni border posts. The journey should take you approximately 2 hours from Maputo. Drive to Manzini, and take the highway to Mbabane (MR3). Drive up to Sidwashini off-ramp (Junction 9) and take left then right, follow Waterford Kamhlaba sign posts. Travelling from King Mswati III (KM III) International Airport: There are three daily flights from Johannesburg’s OR Tambo International Airport to KM III. An airport shuttle is available to/from KM III to Mbabane’s Galp Filling Station Bus Stop. From there you can take a taxi or arrange a rental car. Connect to the Mbabane-Manzini Highway and head northwest towards Ngwenya Border Post. At Junction 9 take the off ramp and turn left – Waterford Kamhlaba is then signposted. Citizens of Commonwealth countries generally do not require a visa (Immigrants requiring Visa to enter SD) to visit eSwatini. However, it is advisable that you ensure that you are in possession of a valid passport and Visa (where applicable).